Certain provisions are included in the act as anti tax avoidance measures. Provisions for inclusion in assessee’s income, income of some other person, which is not at arm’s length, are a kind of such provisions. Such provisions arrest tax leakage likely to result from certain transactions with relatives or diversion of title without losing control over the same, etc. Where any person transfers income without transferring the ownership of the asset, such income is taxable in the hands of the transferor. Such transfer may be revocable or irrevocable. The provision applies irrespective of the time when the transfer has been made i.e. it may be before or after the commencement of the Income-tax Act. Any income arising to any person by virtue of revocable transfer of assets is chargeable to tax as the income of transferor. For this purpose, transfer may include any settlement or agreement. The transfer is said to be revocable if it contains any provision for the re-transfer of the whole or any part of the income or assets to the transferor or a right to re-assume power over the whole or any part of the income or assets. If any settlement contains a clause for forfeiture of rights of beneficiaries under certain circumstances, the settlement will be regarded as revocable – CIT vs. Bhubaneshwar Kuer 53 ITR 195 (SC). made before the 1st day of April, 1961, which is not revocable for a period exceeding six years. Provided that the transferor derives no direct or indirect benefit from such income in either case. (2) Notwithstanding anything contained in Sub-section (1), all income arising to any person by virtue of any such transfer shall be chargeable to Income-tax as the income of the transferor as and when the power to revoke the transfer arises, and shall then be included in his total income. (b) “Transfer” includes any settlement, trust, covenant, agreement or arrangement. from a concern in which the individual has substantial interest. However, remuneration, which is solely attributable to technical or professional knowledge and experience of the spouse, will not be clubbed.Where both the spouses have a substantial interest in the concern and both are in receipt of the remuneration for such concern, such remuneration will be included in the total income of the husband or wife whose total income excluding such remuneration is greater. The individual is deemed to have substantial interest, if the beneficiary holds equity share carrying not less than 20% voting power in the case of a company or is entitled to not less than 20% of the profits, in any other concern, not being a company at any time during the Previous Year. Where an asset (other than house property) is transferred by an individual to his or her spouse directly or indirectly otherwise than for adequate consideration or in connection with an agreement to live apart any income from such asset will be deemed to be the income of transferor. (a) if assets are transferred before marriage. (b) if assets are transferred for adequate consideration. (c) if assets are transferred in connection with an agreement to live apart. (d) if on the date of accrual of income, the transferee is not spouse of the transferor. (e) if property is transferred by the Karta of HUF, gifting co-parcenary property to his wife. by her husband for her dress and usual household expenses). If an individual directly or indirectly transfers the assets after 1.6.73 without adequate consideration to son’s wife or son’s minor child (including son’s minor step child or son’s minor adopted child), income arising from such assets will be included in the total income of the transferor from the Assessment Year 1976-77 onwards. 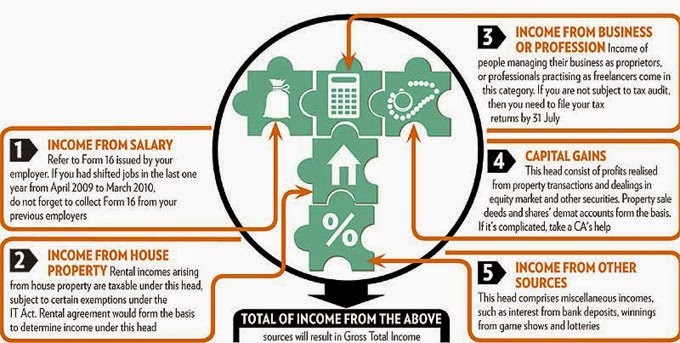 Where an asset is transferred by individual, directly or indirectly, without adequate consideration to a person or persons for the immediate or deferred benefits of his or her spouse or minor child, income arising from the transferred assets will be included in the total income of the transferor to the extent of such benefit. If no income is accrued out of the property transferred by an individual, then nothing will be included in the income of the individual. wife, income arising directly or indirectly from transferred asset will be included in the total income of the transferor to the extent of such benefit with effect from the Assessment Year 1985-86. (b) activity involving application of his skill, talent or specialised knowledge and experience. (i) 1st year : that parent whose income is higher. Subsequent years : the same parent – unless the AO is satisfied that it should be clubbed with the other parent. (ii) Where marriage does not subsist, in the hands of the custodian parent. However, a deduction — Upto INR. 1,500 per minor child [Sec. 10(32)] shall be allowed against such income which is clubbed in the hands of the parent. taxable as the income of the transferor. the transferor will be taxable in his hands. In the above mentioned cases the income arising to the transferee from the property transferred, is taxable in the hands of the transferor. However, income arising to the transferee from the accretion of such property or from the accumulated income of such property is not includible in the total income of the transferor. Thus, if Mr. A transfers ` 60,000 to his wife without any adequate consideration and Mrs. A deposits the money in a bank, the interest received from the bank on such deposits is taxable in the hands of Mr. A. If, however, Mrs. A purchases shares in a company from the accumulated interest, the dividend received by Mrs. A, will be taxable in her hands and will not be clubbed with the income of Mr. A.
circumstances mentioned earlier. For the purposes of including income of the specified person in the income of the individual, the word “income” includes a loss. person (where the Income Tax Officer so desires). In the instant case, Mrs. G along with his sister, holds substantial interest in B Ltd. and Mr. G does not hold professional qualification. Accordingly, remuneration of Mr.G has been included in the total income of Mrs. G.
If the requisite conditions of clubbing are satisfied, clubbing provision will apply even if their application results into lower incidence of tax. Illustration 2. Mrs. C, a law graduate, is legal advisor of L Ltd. She gets salary of ` 1,80,000. 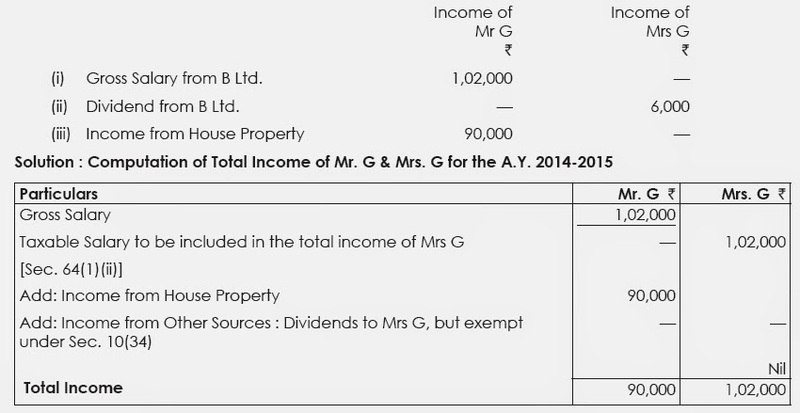 Mr. C is holding 20% shares in L Ltd. His income from business, during the Previous Year 2013-2014 is INR. 4,00,000. Compute their Total Income. Note: Since Mrs. C holds professional qualification, salary income is assessable in her hands. Illustration 3. Mr. B holds 5% shares in A Ltd., where his brother and nephew hold 11% and 6% shares, respectively. Mrs. B gets commission of INR.1,00,000 from A Ltd. for canvassing orders. She holds no technical/professional qualification. Mr. B earns income of INR. 5,00,000 from sugar business. Compute their Total Income for the Assessment Year 2014-15. Note: In the instant case, Mr. B holds 5% and his brother holds only 11% shares in A Ltd. The total of their shareholding is less than 20%. They have no substantial interest. Therefore, commission income is assessable as income of Mrs. B.
qualification. Mr. K gets salary @ INR. 10,000 p.m and Mrs. K gets @ INR. 12,000 p.m. Illustration 5. Mr. A gifts INR. 4,00,000 to Mrs. A on 1st February 2014. Mrs. A starts crockery business and invests INR. 1,00,000 from her account also. She earns profit of INR. 60,000 during the period ending on 31 March 2014. How would you tax the business profits? the Previous Year bears to the total investment in the business on the first day of the Previous Year, will be taxable in the income of the transferor spouse. Illustration 6. Mr. A gifts ` 3,00,000 to Mrs. A on 1st February 2014. Mrs. A invests the same in the existing crockery business where she has already invested ` 5,00,000. Mrs. A earns ` 3,00,000 from the business during the year 2013-2014 ending on 31st March, 2014. How would you assess the profits? Solution : The Previous Year of the existing business is April to March. On the first day of the Previous Year (i.e. 1 April 2013), total investment has come from Mrs. A account. As the proportion of the gifted amount from spouse on 1 April 2013 to the total investment in business on the same day is NIL, the whole of the profits of ` 3,00,000 for the year 2013-2014 will be included in the total income of Mrs A. From the Previous Year 2014-2015, 60% [= 3,00,000/5,00,000 × 100] of the business profits will be included in the total income of Mr. A. How would you assess them for the Assessment Year 2014-2015 ? profits of B unit. Thus, she would be assessed on INR. 4,00,000. (b) The loss from A unit will be included in the total income of Mr Z in view of Sec. 64(1)(iv). “Income” includes “loss” also. Mr Z is entitled to set-off business loss of A’s unit against Income from House Property. Thus, loss of INR. 3,50,000 would be carried forward but could be set-off only against business profits. Illustration 8. Mr. Goutam, out of his own funds, had taken a FDR for INR.1,00,000 bearing interest @ 10% p.a. payable half-yearly in the name of his wife Latika. The interest earned for the year 2013-2014 of INR. 10,000, was invested by Mrs. Latika in the business of packed spices which resulted in a net profit of INR.55,000 for the year ended 31st March, 2014. How shall the interest on FDR and income from business be taxed for the Assessment Year 2014-2015? Solution : Where an individual transfers an asset (excluding house property), directly or indirectly to his/her spouse, otherwise than for adequate consideration, or in connection with an agreement to live apart, income from such asset is included in the total income of such individual [Sec. 64(1)(iv)]. Accordingly, interest on FDR, accruing to wife, is included in the total income of her husband. However, business profits cannot be clubbed with total income of husband. Clubbing applies only to the income from assets transferred without adequate consideration. It does not apply to the income from accretion of the transferred assets. Hence, business profit is taxable as the income of wife. Illustratio 9: Sawant is a fashion designer having lucrative business. His wife is a model. Sawant pays her a monthly salary of ` 20,000. The Assessing Officer, while admitting that the salary is an admissible deduction, in computing the total income of Sawant, had applied the provisions of Sec. 64(1) and had clubbed the income (salary) of his wife in Sawant’s hands. Discuss the correctness of the action of the Assessing Officer. clubbed with the total income of such individual [Sec. 64(1)(ii)]. qualification and the income is solely attributable to the application of such knowledge and experience. Smt. Vatika carried on business with the gifted funds of her husband Mr. Dabbu. For the Previous Year ending 31.3.2014, Vatika incurred loss of ` 5 lakh which Dabbu wants to set-off from his taxable income. Solution : Funds for business were gifted by husband to wife. Accordingly, income from business should be clubbed with the income of husband [Sec. 64(1)(iv)]. “Income” includes “loss” also. Hence, husband is entitled to set-off the business loss of wife against his taxable income. A Salary-earner (and other individual tax payers too) generally do not include specified income of their spouses and minor-children, while filing their own income-tax returns. Starting from Assessment Year 1993-94 all incomes arising or accruing to minor children are to be included in the total income of that parent whose total income (before such inclusion) is greater. The word used is 'all income' but any income arising to the minor child as a result of some manual-work done by him or from such activity involving application of his skill, talent or specialised knowledge and experience is not to be included in the hands of the parents. For example, income of a child actor or singer derived from acting or singing is not covered by this clubbing provision. IF THE PARENTS ARE DIVORCED OR LEGALLY SEPARATED, IN WHOSE HANDS IS THE INCOME OF THEIR MINOR-CHILD TO BE INCLUDED? In such cases, the income arising to the minor-child will be assessed in the hands of that parent who maintains the minor-child in that year. IF IN ANY SUBSEQUENT YEAR THE INCOME OF THE OTHER PARENT BECOMES GREATER, WILL THE INCOME OF THE MINOR-CHILD CONTINUE TO BE ASSESSED IN THE HANDS IT WAS FIRST ASSESSED? total income than his/her spouse. IF THE ASSETS ARE BOUGHT BY THE MINOR CHILD OUR OF GIFTS RECEIVED ON HIS BIRTHDAY, IS THEIR INCOME TO BE CLUBBED IN THE HANDS OF HIS PARENTS? Yes. The law requires it. IS THERE AN EXEMPTION LIMIT FOR CLUBBING OF MINOR CHILD'S INCOME IN THE HANDS OF AN INDIVIDUAL? Yes. The exemption limit is Rs.1500 per child in a year. When the income arises to the spouse of such individual from assets transferred directly or indirectly to the spouse by the individual for inadequate consideration. When the income arises to the son's wife from assets, transferred after 1st June 1973, to the son's wife by the individual for inadequate consideration. When income arises to the son's wife from assets transferred, for inadequate consideration, by the individual to such person for the benefit of the individual's wife or son's wife. IS INCOME FROM 'SHARES' BOUGHT BY AN INDIVIDUAL OUT OF HIS OWN FUNDS BUT INVESTED IN THE NAME OF HIS WIFE, TO BE TAXED IN HIS HANDS? Yes. Certainly, if the funds were transferred for inadequate consideration.